I wrote a piece for The High Calling about adoption. Specifically I wrote about the day we met our son’s family in Southern Ethiopia and the roller coaster of emotions that day held. We woke up early on our third day in Ethiopia. Today was the day we would meet our son’s family. 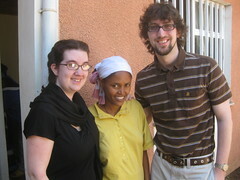 In March of 2009 my wife and I traveled to Ethiopia to adopt our son. We looked into his eyes for the first time on Friday. We spent Saturday morning holding his tiny body in our arms as he slept. On Sunday we wouldn’t see him at all, but we would meet his birth family. We crowded into a van and drove three and a half hours to the Hosanna region in Southern Ethiopia. We were told to expect a harrowing journey—bumpy roads, no seat belts, crazy drivers. This trip is the reason we purchased emergency medical evacuation insurance. But the newly paved road was smooth and offered beautiful glimpses of life in rural Ethiopia. We saw cows and goats crowding the road. We stopped to tour a traditional thatched roof hut. I saw women gathered around a muddy stream with yellow jerry cans, collecting their daily water. If you want more on our adoption experience, you can always check out my book Addition by Adoption: Kids, Causes & 140 Characters.